The Crimson Skew is the third and final book in the Mapmaker’s Trilogy, a fantasy series unlike any other. The first two books (The Glass Sentence and The Golden Specific) set up the main plot. In 1799 the world experienced what is known as the Great Disruption—all of the continents were strangely pulled out of time and put back in different eras. Nearly a century later, Sophia and Theo, two young friends searching for answers in this disjointed universe, continue on their separate journeys in this exhilarating conclusion to the trilogy. Sophia is closer than ever to finding out the truth about the disappearance of her parents. Theo is forced to fight in a war he does not believe in, while Sophia’s Uncle Shadrack is forced to work in a government he does not believe in. They all have very important roles to play in the final battle and the future of the world. S.E. Grove has created a wonderfully unique series with multiple layers for students and teachers to explore. On the surface, this is an entertaining fantasy and adventure story for kids. Deeper, there are themes of xenophobia and racism and how people’s actions have an affect on the world on a fundamental level. 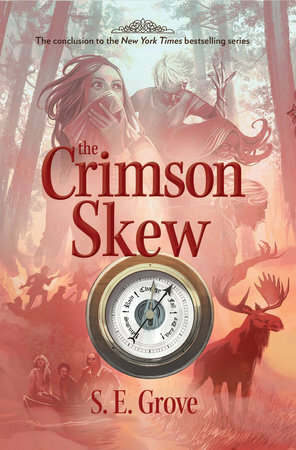 The Crimson Skew and the entire trilogy are great fun books to read, as well as perfect choices for book groups and class reading.